The Crew 2 might be out today, but there’s an even hotter racer out there right now – Overwatch. That’s right, the arrival of newest hero Hammond (also known as Wrecking Ball, but that’s a lot less adorable) has got Overwatch players feeling the need for speed. 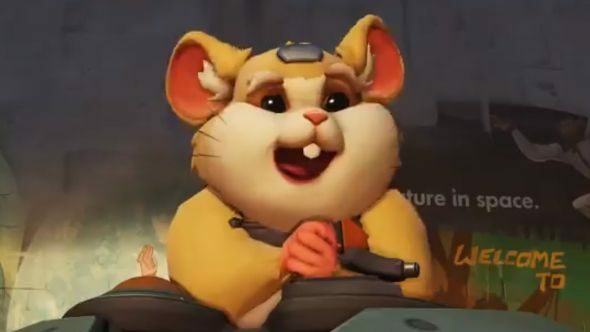 If you somehow missed the reveal and subsequent PTR release last night, Hammond is a super-intelligent hamster who pilots a mech. His machine is similar to Overwatch’s D.Va, but there’s one key difference – Hammond can curl into a ball and roll around to move about faster. Ok, maybe I’m reaching with this one, but if a mech piloted by a hamster isn’t a good reason to share our list of the best racing games, what is? On top of that, he has a grappling hook, which he can use to swing into hard-to-reach spots. Alternatively, however, he can use it to speed himself up as he rolls along. Perhaps unsurprisingly, Overwatch’s community has adapted to this by creating ‘Hammond Racing’. If you’re wondering exactly what that is, you’ll be pleased to learn it’s almost exactly what it sounds like. In a video posted to Twitter last night, Overwatch streamer Daniel Fenner posted a clip of Hammond Racing. Taking place on the Junkertown map, it tasks two full teams of Wrecking Balls with making their way from one end of the map to the other. Fastest hamster wins. Using grappling hooks and shortcuts, it actually makes from some thrilling viewing, especially as one player sneaks to the front of the pack via a route that no-one else seems to notice. You can check out the video in the tweet above. Meanwhile, check out our list of possible new Overwatch heroes – now Hammond has arrived, speculation as to who hero 29 will be must surely begin, so prepare for fans to start hunting fervently for easter eggs.